Serving the Sportsman for over 30 years. 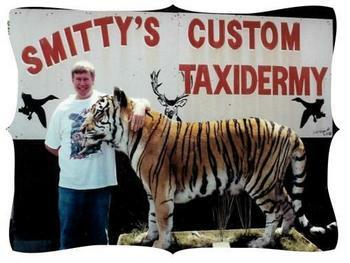 Welcome to Southeastern Oklahoma's leading taxidermy studio. My name is Smitty. I am the owner and head taxidermist. Come on in and look around. We are located 3 miles west of Durant, Oklahoma,on Hwy 70. Just 8 miles from beautiful Lake Texoma. 20 miles North of the Sherman, Denison, Texas area. And 50 miles east of Ardmore, OK.
We have over 35 years of experience in all native and most exotic game. We are also the leading African game studio in the area. We welcome sportsmen from all over the U.S. A large number of our clients come from the Dallas Ft. Worth area, as well as Oklahoma City. They find that our prices are much lower and our turn-around time much faster, than the big city guys. All this with out sacrificing any quality. Come give us a try. We love what we do and it shows! You can check out examples of our work in the individual pages.